Line your baking tins. I used four 7 inch square tins to make a rectangle shape. Fold in the flour and add the vanilla essence and make sure that everything is combined well before dividing the mixture evenly between the tins. Bake for around 25-25mins and allow to cool before decorating. When the cakes are completely cooled down, spread jam onto two of the cake squares and sandwich the other two squares on top. The two cakes should be side by side to make a rectangle shape. Mix together the icing sugar, butter and vanilla essence to make up your buttercream (sieve the icing sugar to avoid sugary lumps) and spread a thin layer over the cake. You can also use this to hold the two squares together. Add some food colouring to half of your royal icing to make it the desired shade (I used black colouring to make grey icing). Then roll out a sheet of icing big enough to cover the whole cake. Roll out the remaining royal icing and cut into square and rectangle shapes to create keys. 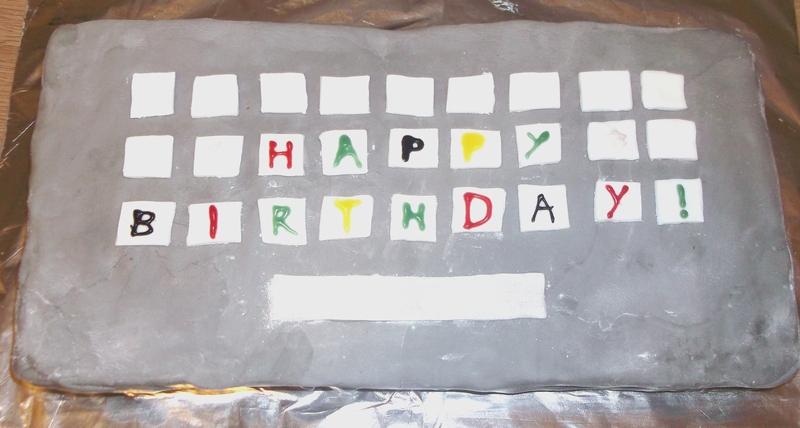 You can stick the keys on to the cake using some left over buttercream. Use the icing pens to write a “Happy Birthday” message on your keys. I was always lucky in that my mum made me a special cake every year for each of my birthdays. I still remember the clown cake she made me for my 5th birthday! I decided to volunteer for FCFK Hackney as it make me really sad to think that a child will miss out on these special memories and it’s great to help in the local community (I work for a publisher based in Hackney). I’m looking forward to making my next cake already!